The Acharnians or Acharnians is the third play — and the earliest of the eleven surviving plays — by the Athenian playwright Aristophanes. It was produced in 425 BCE on behalf of the young dramatist by an associate, Callistratus, and it won first place at the Lenaia festival. The play is notable for its absurd humour, its imaginative appeal for an end to the Peloponnesian War and for the author's spirited response to condemnations of his previous play, The Babylonians, by politicians such as Cleon, who had reviled it as a slander against the Athenian polis. In The Acharnians, Aristophanes reveals his resolve not to yield to attempts at political intimidation. 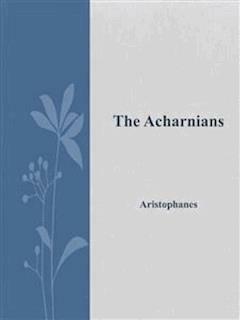 Along with the other surviving plays of Aristophanes, The Acharnians is one of the few - and oldest - surviving examples of a highly satirical genre of drama known as Old Comedy. What cares have not gnawed at my heart and how few have been the pleasures in my life! Four, to be exact, while my troubles have been as countless as the grains of sand on the shore! Let me see! of what value to me have been these few pleasures? Ah! I remember that I was delighted in soul when Cleon had to cough up those five talents; I was in ecstasy and I love the Knights for this deed; "it is an honour to Greece." But the day when I was impatiently awaiting a piece by Aeschylus, what tragic despair it caused me when the herald called, "Theognis, introduce your Chorus!" Just imagine how this blow struck straight at my heart! On the other hand, what joy Dexitheus caused me at the musical competition, when right after Moschus he played a Boeotian melody on the lyre! But this year by contrast! Oh! what deadly torture to hear Chaeris perform the prelude in the Orthian mode!-Never, however, since I began to bathe, has the dust hurt my eyes as it does to-day. Still it is the day of assembly; all should be here at daybreak, and yet the Pnyx is still deserted. They are gossiping in the market-place, slipping hither and thither to avoid the vermilioned rope. The Prytanes even do not come; they will be late, but when they come they will push and fight each other for a seat in the front row. They will never trouble themselves with the question of peace. Oh! Athens! Athens! As for myself, I do not fail to come here before all the rest, and now, finding myself alone, I groan, yawn, stretch, fart, and know not what to do; I make sketches in the dust, pull out my loose hairs, muse, think of my fields, long for peace, curse town life and regret my dear country home, which never told me to "buy fuel, vinegar or oil"; there the word "buy," which cuts me in two, was unknown; I harvested everything at will. Therefore I have come to the assembly fully prepared to bawl, interrupt and abuse the speakers, if they talk of anything but peace. [The Orchestra begins to fill with people.] But here come the Prytanes, and high time too, for it is midday! There, just as I said, they are pushing and fighting for the front seats. Step forward, step forward; get within the consecrated area. No! I am an immortal! Amphitheus was the son of Ceres and Triptolemus; of him was born Celeus, Celeus wedded Phaenerete, my grandmother, whose son was Lycinus, and, being born of him I am an immortal; it is to me alone that the gods have entrusted the duty of treating with the Lacedaemonians. But, citizens, though I am immortal, I am dying of hunger; the Prytanes give me nothing. Oh, Triptolemus and Celeus, do ye thus forsake your own blood? Prytanes, in expelling this citizen, you are offering an outrage to the Assembly. He only desired to secure peace for us and to sheathe the sword. No, by Apollo, I will not, unless you are going to discuss the question of peace. Of what King? I am sick of all those fine birds, the peacock ambassadors and their swagger. During the archonship of Euthymenes, you sent us to the Great King on a salary of two drachmae per diem. We suffered horribly on the plains of the Cayster, sleeping under tent, stretched deliciously on fine chariots, half dead with weariness. And I was very much at ease, lying on the straw along the battlements! Everywhere we were well received and forced to drink delicious wine out of golden or crystal flagons. . . .
For great feeders and heavy drinkers are alone esteemed as men by the barbarians. Just as here in Athens, we only esteem the wenchers and pederasts. At the end of the fourth year we reached the King's Court, but he had left with his whole army to take a crap, and for the space of eight months he was thus sitting on the can in the midst of the golden mountains. And how long did it take him to close his arse? A month? After this he returned to his palace; then he entertained us and had us served with oxen roasted whole in an oven. Who ever saw an ox roasted in an oven? What a lie! And one day, by Zeus, he also had us served with a bird three times as large as Cleonymus, and called the Hoax. And do we give you two drachmae, that you should hoax us thus? I would a crow might pluck out yours with his beak, you cursed ambassador! Good God! Friend, with your great eye, round like the hole through which the oarsman passes his sweep, you have the air of a galley doubling a cape to gain port. Come, Pseudartabas, give forth the message for the Athenians with which you were charged by the Great King. I artamane Xarxas apiaona satra. He says that the Great King will send you gold. [to Pseudartabas] Come, utter the word 'gold' louder and more distinctly. Ah! God help us, but that's clear enough! That the Ionians are gaping-arsed, if they expect to receive gold from the barbarians. Not so, he speaks of bushels of gold.